Sony is releasing limited edition Graphic Splash VAIO FZ series notebooks designed by New York artist Maya Hayuk. 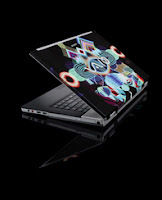 In addition to the "Grow" Edition, Sony is also releasing the VAIO FZ-series Graphic Splash Maya Hayuk "Never Stop" Edition (VGN-FZ190E/2).Maya Hayuk has been known for her colorful and symmetrical imagery. Like the "Grow Edition", Hayuk transformed the VAIO FZ-series notebook into a stunning work of art. The VAIO FZ Series Graphic Splash "Never Stop" Edition has a kaleidescope design and decked with interlacing lines and spherical shape. Like the "Grow" Edition, a wallpaper and screensaver that matches the design outside the notebook is included together with a certificate of authenticity with Hayuk's original signature. The magnesium chasis makes the VAIO FZ-series "Never Stop" Edition lightweight but durable. The VAIO FZ series Graphic Splash "Never Stop" Edition has a 15.4 inch WXGA LCD screen, 2 GHz Intel Centrino Duo Processor, 2 GB DDR2 memory upgradeable to a maximum of 4 GB, 200 GB hard disk drive, BD-RE/DVD±R DL/DVD±RW/DVD-RAM optical drive, Sony Sound Reality audio enhancer, NVIDIA GeForce 8400M GT GPU Graphics Card, HDMI, VGA and S-Video Out with Smart Display Sensor Interface, Built-in Bluetooth, Intel PRO/Wireless 4965AGN Network Connection, and built-in web camera. The VAIO FZ-series "Grow" Edition has these ports included: Memory Stick Media Slot, Secure Digital Slot, Express Card Slot, Headphone Jack, Microphone Input, 3 USB 2.0 Port, VGA Output, Modem Jack, Ethernet Port, and i.LINK Connection. The VAIO FZ-series notebook incorporates the Instant Mode technology which lets users listen to music or watch DVDs on their notebook without ever booting up operating system letting users save battery life. Dedicated A/V buttons can be found on the notebook so that users can play, pause, rewind, stop, eject and control volume with one-touch ease. With Sony's original Sound Reality technology incorporated on the FZ series, users will enjoy high quality audio performance on their notebook and also supports Direct Stream Digital Technology which offers professional quality, high-resolution surround-sound support. Together with the FZ-series' support for High Definition video playback, watching HD movies on the notebook will truly be an enjoyable experience. The VAIO FZ series' battery life is estimated at 2-4 hours using standard battery and 3.5-6.5 hours using a large capacity battery. The Sony VAIO Graphic Splash Maya Hayuk "Never Stop" Edition notebook is already available at SonyStyle online stores and will cost about $2,500.